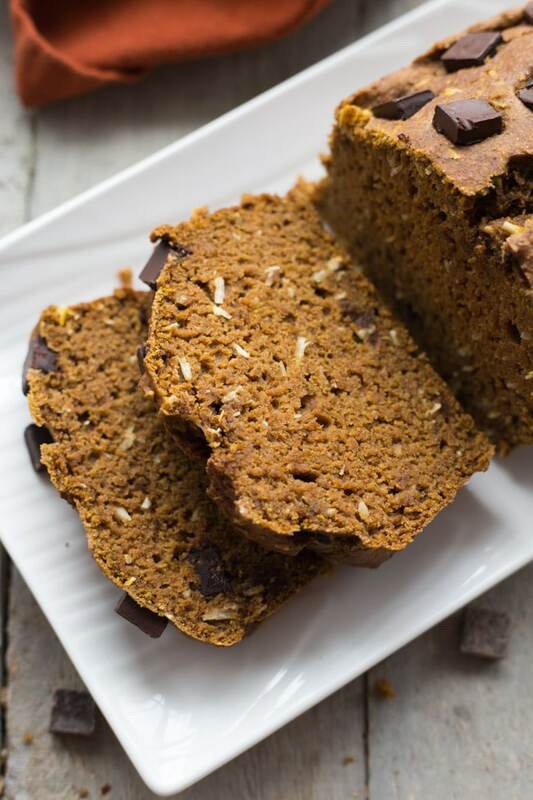 I have a clean eating Halloween treat for you today – Coconut Chocolate Chunk Pumpkin Loaf! Okay, so it’s not a chocolate covered candy treat, but it’s cake and it has chocolate in it. So in my books, it’s a treat! Happy Halloween everyone! What are your plans for today? For this evening? While I plan on making a few Halloween treats today (because I took the day off work – yay! ), I’ll be spending most of my day working on a few Christmas recipes to kick off November. I know! Can you believe we are talking Christmas cookies already?! I’m actually really excited about Christmas baking this year! I usually get started in early November every year. But this year I’ve started a bit earlier, just because I have so many recipes I want to share with you guys. Lots of cookie recipes, of course, but a few brunch and savoury dinner recipes too! So, to sum up…..Christmas baking is well under way in my house, and I may have even started listening to Christmas music! I know…..it’s early. You can judge all you want, but Christmas music just puts me in a good mood! Now that I’ve gone down that Christmas rabbit trail, let me introduce you to today’s recipe for Coconut Chocolate Chunk Pumpkin Loaf. It’s pumpkin-y and coconut-y with lots of spice and dark chocolate chunks. Yup, chunks! I’m just by-passing the chips altogether and going right for the chunks today! This Coconut Chocolate Chunk Pumpkin Loaf is actually similar to my Coconut Carrot Bundt Cake. It’s egg-less, with whole wheat flour, extra virgin olive oil and coconut! Don’t you just love the taste and texture that coconut adds to muffins and cakes? I also tend to sprinkle it on chocolate covered cookies and desserts….and, of course, smoothie bowls and pancakes! Needless to say, I go through a lot of coconut during the height of Christmas baking season! 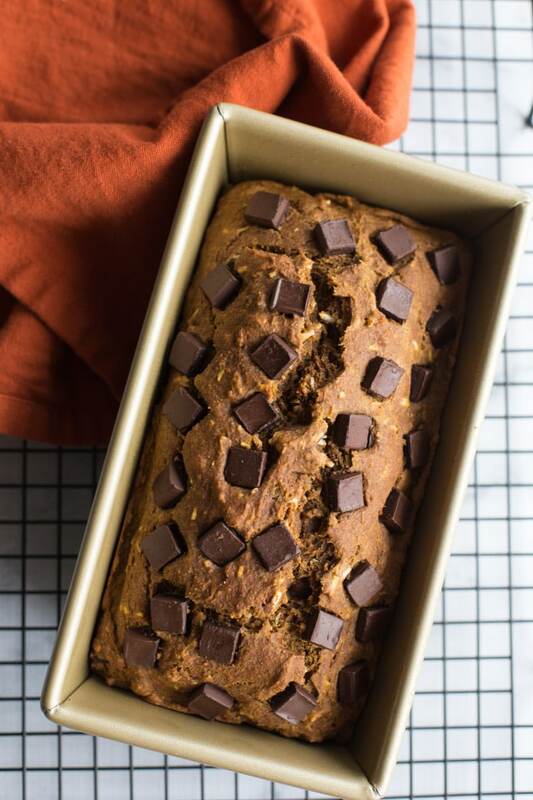 The magic ingredient in this Coconut Chocolate Chunk Pumpkin Loaf (aside from the coconut and dark chocolate chunks) is the pumpkin purée. It adds more fibre to the loaf, but more importantly, it keeps it super moist. I haven’t been able to stop snacking on this cake since the first loaf I made last week! It’s great as a dessert, but I’ve actually been enjoying it as a mid-morning snack 🙂 . And with that, I’m going to keep this post short and sweet, and go grab myself a cup of pumpkin pecan coffee, a slice of this loaf and savour the morning. Hope you have a great day and a Happy Halloween! 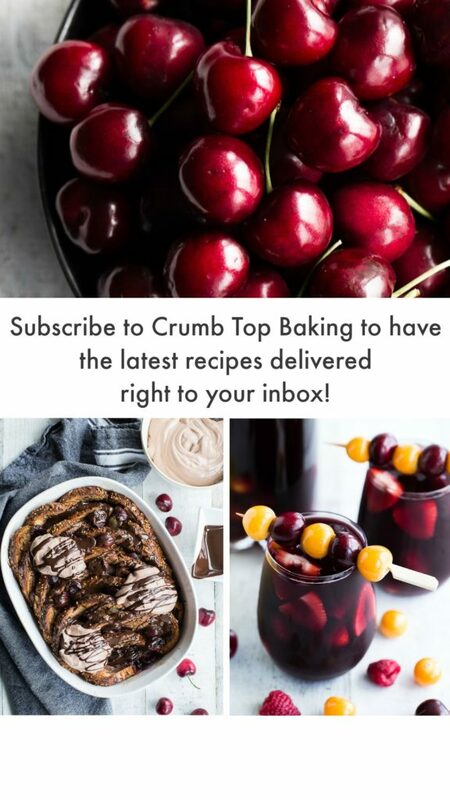 By the way, Crumb Top Baking is now on Facebook and Pinterest, so if you like this recipe, please feel free to share! 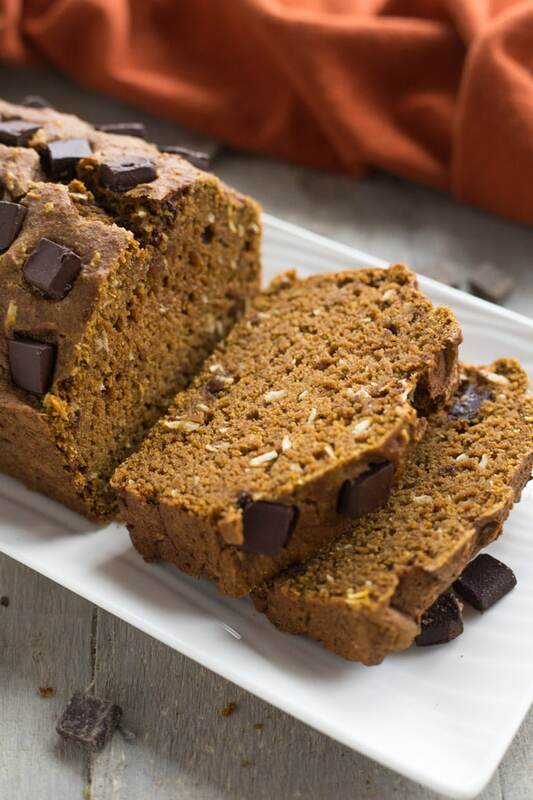 Coconut Chocolate Chunk Pumpkin Loaf is deliciously moist and super easy to make with this clean eating recipe. All you need are ingredients like whole wheat flour, coconut, pumpkin, extra virgin olive oil and cashew milk. Set aside 10 minutes to prepare and 50 minutes to bake, and you have yourself a wholesome little dessert or snack! Pre-heat oven to 350 degrees and grease a 9″ x 5″ loaf pan. In a large bowl, add the flour, sugar, coconut, pumpkin spice, baking soda and salt. Stir until combined. In a small bowl, add the milk, pumpkin purée, oil and vanilla. Whisk until well combined. Make a well in the middle of the dry ingredients and add the wet ingredients. Stir until all the dry ingredients are well incorporated. Do not over-mix. Stir in 1/4 cup of chocolate chunks. Pour batter into prepared loaf pan. Press the remaining chocolate chunks into the top of the loaf. Bake for 50 minutes, or until a tooth pick inserted in the middle comes out clean. Cool in the pan for 20-30 minutes before turning out onto a cooling rack. Allow the loaf to cool fully before slicing. Store in an airtight container on the counter and consume within 3-4 days, or freeze for later enjoyment. I only add 1/4 cup of the chocolate chunks to the pumpkin loaf batter. It’s difficult to get them to evenly disperse, so I like to use the other 1/4 cup to cover the top, ensuring that every bite has some chocolate. Be sure to press the chocolate chunks into the batter, so they don’t fall off when the loaf rises! You can also make muffins out of this recipe. Just follow the instructions above, but use a 12-muffin pan. Bake on 400 degrees for 5 minutes, and then reduce the heat to 350 degrees and bake for another 15 minutes, or until a tooth pick inserted in the middle of a muffin comes out clean. 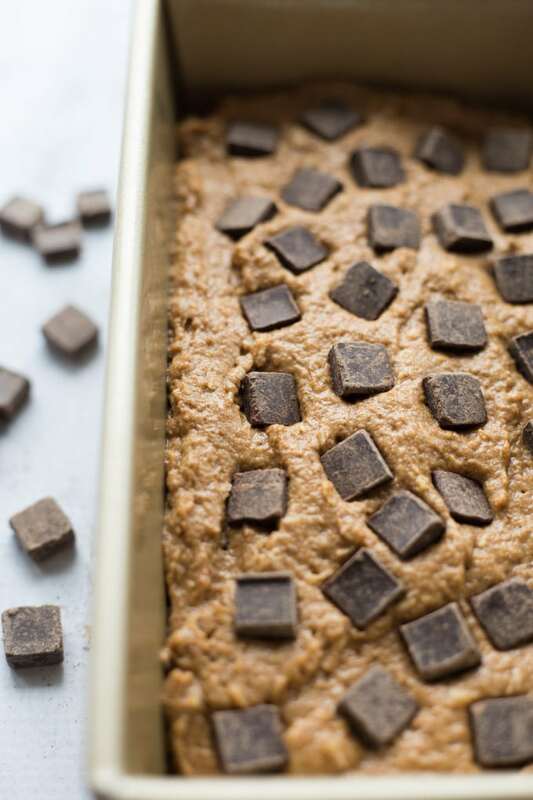 I love how healthy and moist this looks (other than those necessary chocolate chunks)!! I’ve never thought to include coconut in a pumpkin loaf. I can’t wait to try it!! PS – my mind is already all over Christmas cookies!! Thanks Katherine! 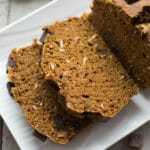 I’m always adding coconut to cakes, and it works really well in this pumpkin loaf. And, of course, you can’t go wrong with dark chocolate! Let me know if you try it! Pumpkin and coconut and chocolate? You’re speaking my language :). This looks divine! PS, I’ve been working on Christmas cookies too. It’s hard not to get excited about holiday baking isn’t it? Happy Halloween! Thanks Kelsie! 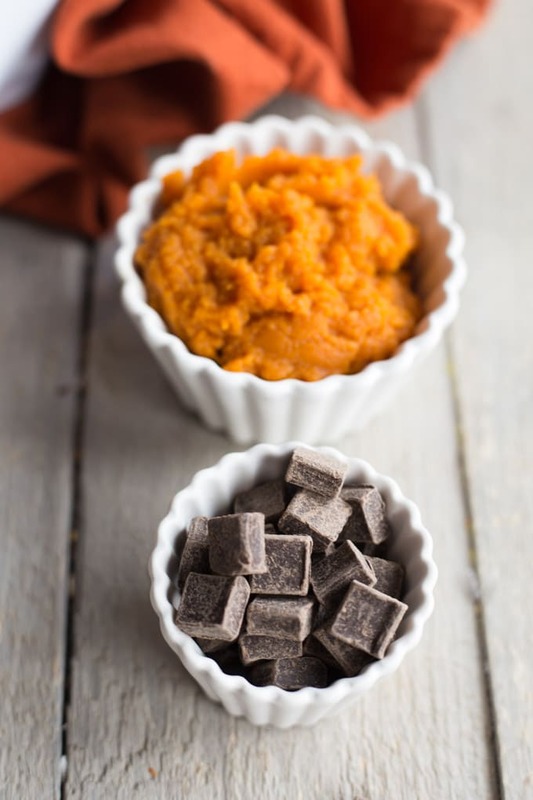 Pumpkin, coconut and chocolate is a pretty awesome combination! I’ll probably find some way to incorporate it into my Christmas baking too. Totally excited about holiday baking! Happy November!! Looks so yummy! I love baking with olive oil in recipes, and all the rest of the ingredients, how could anyone resist and it’s healthy so we get more slices, right? Looks irresistible Leeanne! I’m Christmas baking too, so I’m right along with ya! Bring on all the goodies!! Thanks Kim! I’ve definitely had more than one slice of this loaf! It’s so good my husband is even eating it!! As for the Christmas baking, I figured I was in good company ;). Christmas will be here before we know it! 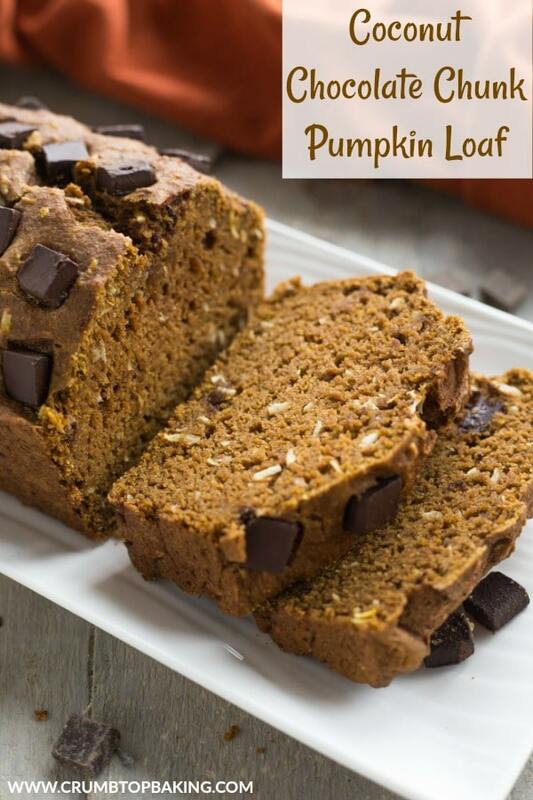 I love a good pumpkin loaf and so happy to see chocolate chunks and coconut!! What a great additions to the flavors. Delicious! Take care. Thanks Stacey! Can’t go wrong adding chocolate chunks and coconut to a loaf ;)! Happy weekend!